All you have to do is enter below for a chance (or two or three) to win! *The fine print: This giveaway is open to US residents only, 18 years or older. The winner will be selected at random by Rafflecopter. The winner will receive one (1) pair of sunglasses valued at $10.99. By entering your e-mail address, you agree to receive e-mails from Fab Impressions, I promise not to spam you (unless you spam me first then all bets are off) and I won’t share your email address with anyone. Entries will be accepted up until 11:59 PM EST August 11th and the winner will be announced on Facebook and Twitter on Sunday, August 12th (winner will also be notified via email). Item was purchased by me, with my money, and is being offered as a freebie cuz I love ya! cuteness!!! 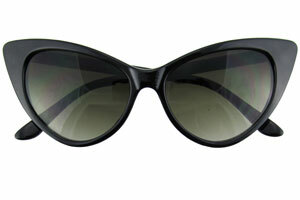 Since I need a new pair of black shades, I would rock these any time I need black shades. And the cat-eyes would make these absolutely adorable with my hair up in a chic bun, and a great red lip going on, probable w/a pair of simple diamond or pearl studs to keep the attention on these Fab shades! Sounds so very Breakfast at Tiffany’s! I love it! You had me at red hair! I’ll rock these with my polka dot dress and fun sandals! So cute! I love polka dots, especially different sized dots worn together. a bright maxi and flowy white tank. statement necklace and arm party to boot! 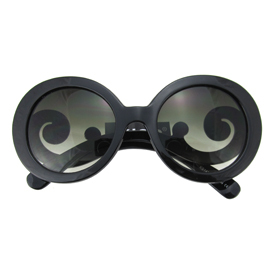 I think these would be best with a simple outfit… so the sunglasses stand out! Good point! Let the glasses be the star. Right! They are dope. I ’bout had a fit when I first saw ’em. These sunnies are fantastic. I’d rock them with a sophisticated rocker girl look, pleated maxi skirt, distressed t-shirt and biker jacket. The shades are perfect for the homecoming game! I would rock these with my black and red sorority girl tee- shirt and of course the floppy sun hat! Finished off with simple ny&company skinny jeans and a cute sandal. Gotcha on the auto correct 🙂 The floppy sun hat is a MUST. Absolutely love the cat eye eyes — very chic! opps — typo, cat eye glasses!